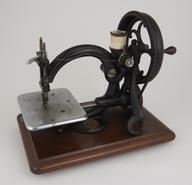 1857 - James Edward Allen Gibbs (1829–1902), farmer from Raphine in Rockbridge County, Virginia patented the first chain-stitch single-thread sewing machine on June 2, 1857; company formed from the partnership of James Willcox, his son Charles and James E. A. Gibbs in order to make the first practical single thread chain stitch machine for domestic use as patented by Gibbs in 1856 and 1857. The actual manufacturing was done by Browne and Sharpe until 1948 and possibly later. 1908 - English company founded in 1908.